Enjoy the perfect combination of sleek style and comfort with this dresser and mirror set. 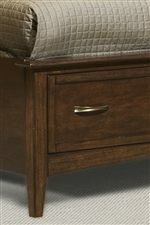 This piece is crafted of hardwood solids and cherry veneers in a beautiful cherry finish, which accentuates the antique brass drawer pulls nicely. The mirror features flaired vertical cut-outs along the sides, while the seven-drawer dresser offers plenty of spacious storage. This dresser and mirror set is the perfect piece to add to your bedroom décor. 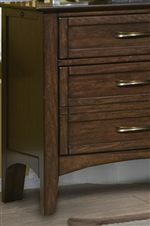 The Stanford Heights Dresser and Mirror Set in Cherry Finish by Vaughan Furniture at AHFA in the area. Product availability may vary. Contact us for the most current availability on this product. Warranty Warrants the original purchaser, that products shall be free of defects in material and workmanship under normal use for one year. During the one-year warranty period products may be repaired or replaced, if proven to be defective under normal use. The Stanford Heights collection embodies both sleek style and comfort, the perfect combination for your bedroom décor. Smooth curving angles and flaired vertical cut-outs add to the visual appeal of this collection. 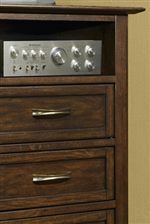 This collection is constructed of hardwood and cherry veneers in a beautiful cherry finish, with antique brass drawer pulls. 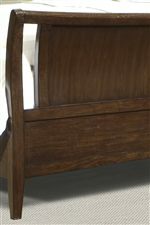 Stanford Heights is a stylish, yet, comfortable collection that will be right at home in your bedroom décor. 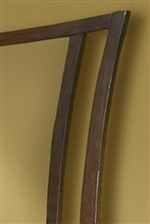 The Stanford Heights collection is a great option if you are looking for Transitional furniture in the area. Browse other items in the Stanford Heights collection from AHFA in the area.